The language is remarkably familiar to readers of Chinese state-owned newspapers, like China Daily. The choice of wording was clearly not aimed at winning any plaudits from Mongolians, who are outraged by patronizing attitudes seeped in Han chauvinism. Undoubtedly, the characterizations did appeal to the Communist Party of China (CPC), who thinks of itself in the righteous and benevolent terms of being an “older brother” lending a hand to its less sophisticated neighbors. The website in question is operated by devotees of Dorje Shugden, a Tibetan Buddhist spirit that has become the flashpoint for a schism in the Gelukpa or “Yellow Hat” order. The historic roots of the schism lie in a rivalry between the Fifth Dalai Lama (1617-1682) and another highly placed lama of that era, Drakpa Gyeltsen (1619-1656). The dispute broke out in the mid-1970s as the exiled Tibetan community struggled to rebuild outside Tibet. The disagreement released deeply felt emotions that may have culminated in the 1997 murder of a high ranking Gelukpa lama and his two disciples in Dharamsala. The schism rumbles on today, producing the unusual image of Western Buddhist monks protesting the Dalai Lama with placards mocking him and denouncing his supposed perfidy. However, the controversy seems to have expanded from a theological one to the geopolitical realm. Certainly, more is going on here than meets the eye. For a secular materialist, this saga presents an unusual blend of Buddhist metaphysics and factional squabbling that might be better suited to a novel by J.R.R. Tolkien or J.K.Rowling. Nonetheless, it is a deadly serious business that creates conflict among the global Vajrayana Buddhist community. While concrete proof is not available, the tone of some Shugden devotees evinces the possible influence of the Chinese authorities, who, in the mode of other hegemons, are likely to be fanning the flames of religious unrest for their own geopolitical objectives. This is a short-sighted policy that poses the risk of unintended consequences for China’s long-term interests. To understand the schism, we have to examine the intricacies of Tibet’s history and theology. Tibet adopted Buddhism during the earliest days of its recorded history in the seventh century. According to Buddhist belief, the legendary Indian yogi Padma Sambhava had converted Tibetan local spirits to be protectors of Buddhism, creating the metaphysical foundation for the introduction of monasteries. This earliest form of Buddhism came to be known imprecisely but commonly as “Red Hat Buddhism.” Following the example of Padma Sambhava, its adherents endorsed an intellectual approach that rejected linear thought as well as social rules and restraints in their search for enlightenment. As a way to break through conventional thinking, the Red Hat Buddhists practiced esoteric rites that sometimes clashed with mundane morality or ordinary notions of social conduct. In response, the Gelukpa order came into existence in the 15th century as a reform movement that emphasized monastic discipline and a scholastic understanding of the tenets of Buddhism. At its inception, it was nonsectarian, adopting treatises from a wide array of Tibetan philosophical schools. However, its members believed that some of the practices of the Red Hat Buddhists were less effective and potentially harmful for spiritual cultivation. Although it was a minor sect at first, it soon grew into importance because of the philosophical vigorousness and the strict discipline of its monks. A lineage of reincarnated lamas, later to be known as the Dalai Lamas, was a source of influential figures and learned clerics within the order. In the 16th and early 17th century, Tibet suffered from political disunity and sectarian fighting among its Buddhist orders, though doctrinal differences among the sects were not necessarily at the core of this unrest. For centuries, Buddhist monasteries and local Tibetan nobles set up alliances for the pursuit of wealth and power, consequently clashing with others seeking the same. With the assistance of some noble clans and Mongolian military support, the Gelukpa were able to assume political authority in 1642, with the Fifth Dalai Lama as its paramount leader. This inaugurated an era of Gelukpa political dominance that only came to an end with the People Liberation Army’s arrival in Tibet in 1951. The current schism originates in a feud between two highly-placed lamas in the 17th century. The legacy of the Fifth Dalai Lama looms large over Tibet history. He is remembered as a celebrated polymath and astute politician whose 44-year reign inaugurated a golden age in Tibetan civilization. Born into a Red Hat family, the ”Great Fifth” was not a Gelukpa purist. In matters of philosophical inquiry, he propounded an eclectic approach to the various schools of Tibetan Buddhism, including the Red Hat sects, and combined rituals and concepts in an ecumenical manner. He did not hesitate, however, to adopt hostile measures toward those orders or monasteries that challenged his authority or that had sided against the Gelukpa in the battles earlier that century. The rise of the Great Fifth’s authority did not occur without factional squabbling within his own order, however. As a young child, Drakpa Gyeltsen was one of the other candidates for selection as the successor-reincarnation of the Fourth Dalai Lama. A lifelong rival of the Great Fifth, he was a highly accomplished teacher and debater who enjoyed a strong following among Yellow Hat monks, thereby triggering the animosity of the Fifth Dalai Lama and his political supporters. These political intrigues eventually resulted in several assassination attempts against Drakpa Gyeltsen. According to legend, the besieged lama wearily told a disciple that he expected to die prematurely. If he was the victim of a murder plot, he said that his body would release a black-colored cloud of smoke in the shape of an open hand at his cremation. The death of Drakpa Gyeltsen remains shrouded in mystery. He was reportedly found strangled by a khadag, a silken scarf given by the Fifth Dalai Lama in recognition of Drakpa’s victory in a debate. His supporters claimed that the Dalai Lama’s supporters arranged for his assassination while his detractors said that he committed suicide, a gravely discrediting sin in Buddhism. Later, in subsequent retellings, it was said that he died because he had been tampering with black arts of sorcery. At his cremation, the fires yielded black smoke shaped like a hand, as predicted, whereupon his disciple pleaded with him to take revenge on his enemies. One version of the legend holds that the spirit of Drakpa Gyeltsen did not continue into the normal cycle of reincarnation on account of this plea, but instead became a wrathful spirit, filled with outrage at the injustice done to him and seeking retribution. Other versions of the legend question whether the wrathful spirit was related to Drakpa Gyeltsen at all. The spirit became known as Dorje Shugden and was revered in Gelukpa monasteries throughout Tibet as a dharma protector for the Gelukpa against the enemies of the order. It was believed that monks initiated into the Shugden practice benefit from the spirit exerting his supernatural powers to protect and reward them. The propitiation of Shugden spread to other Gelukpa monasteries as an addition to the devotional practices for the hundreds of other deities in the Buddhist spiritual world. As the 18th and 19th centuries wore on, some Gelukpa monasteries became more aggressive in their theological criticisms of Red Hat Buddhism, which led to violent clashes and in some instances, the forcible conversion of Red Hat monasteries to the Gelukpa order. In the 19th century, Eastern Tibet saw the rise of the Rimé movement, which was a scholastic trend that advocated nonsectarianism and an eclectic study of Vajrayana Buddhist treatises. The movement gathered momentum and became a part of the Tibetan philosophical mosaic, pursuing a course not unlike that of the Great Fifth. In reaction to this theological development, several high Gelukpa lamas in Lhasa reasserted the primacy and purity of Gelukpa teachings in the early 20th century by elevating Dorje Shugden to the role of the chief of the dharma protectors. An incarnate lama and Shugden devotee, the esteemed Trijang Rinpoche, later became the junior tutor of the current Dalai Lama, who was likewise initiated into the Shugden rites. In all, Shugden worship was little more than a sidenote to the history of Vajrayana Buddhism until after the flight of the Dalai Lama to India in 1959. It co-existed, at times uneasily, with other viewpoints within Tibet’s theocratic society. In the aftermath of the 1959 exodus, the Tibetan clergy re-established their monasteries in India and Nepal, gradually rebuilding the institutions of their faith. At first, Shugden propitiation and the “purity” of the Gelukpa order were minor issues made less significant because of the collective revulsion felt among Tibetans about China’s excesses during the Cultural Revolution. The dispute took on an entirely new relevance in 1975 when Zemey Rimpoche, a disciple of Trijang Rinpoche, published a manuscript titled The Yellow Book. It was written in an unabashedly sectarian manner, advocating a purist approach for the Gelukpa order and describing how Dorje Shugden had historically struck down those high-ranking Gelukpa lamas who had “contaminated” their practices by incorporating Red Hat rituals. The perspective adopted by The Yellow Book called for a purge of Red Hat practices as irredeemably tainted conduct promoted by the enemies of Buddhism, who, more precisely, were interpreted to mean the enemies of the Gelukpa order. The Dalai Lama saw the book as a direct affront that fostered sectarian strife at a vulnerable time in the history of Tibetan civilization. One scholarly analysis interprets the arguments made in The Yellow Book as working directly against the theological theories that had formed the foundations of the Fifth Dalai Lama’s government – a combination of veneration for Red Hat saints such as Padma Sambhava, and the teachings of the Gelukpa – which were perceived by the Dalai Lama as essential for the future of the Tibetan state and society. The Dalai Lama’s formal stance, gradually formulated throughout the 1980s, bases his opposition to Shugden worship on three reasons. First, he believes that it promotes a form of spirit propitiation that departs from the rich philosophical traditions of Vajrayana Buddhism. Second, it is an obstacle to nonsectarianism and “inter-religious understanding and harmony.” Third, the Tibet people need unity at this dire stage in their history rather than sectarian disputes among their clergy. His Holiness has gone on to say that it is a decision for each Shugden devotee whether to agree with his views. However, he requested that “those who continue to propitiate [Shugden] not to attend his formal religious teachings, which traditionally require the establishment of a teacher-disciple relationship.” Shugden devotees may worship as they please, but His Holiness cannot be their guru for the reasons explained above. This development caused considerable dismay among the Gelukpa clergy, many of whom had both sincerely propitiated Shugden and respectfully revered His Holiness. For Shugden devotees caught in the middle, it is said that they felt like a child witnessing a bitter fight between a mother and a father. Other devotees, however, picked up the fight in written exchanges that grew increasingly vitriolic between the two sides. The building crescendo of hostility may have led to the unsolved murder of Geshe Lobsang Gyatso, the director of the Institute of Buddhist Dialectics in Dharamsala, and his disciples in Dharamsala in 1997. The director had been the author of numerous works robustly condemning Shugden propitiation. Indian police believe that Shugden partisans might have been responsible but they had fled to China before they could be interrogated. The Shugden groups strongly deny any connection to the murder. Further, they denounced the Dalai Lama for “banning” the Shugden practice and directing discriminatory retribution against them based on their faith – an assertion that is dismissed by the Office of His Holiness. 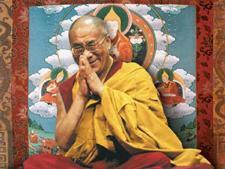 The schism between His Holiness and the Shugden devotees began to spread globally, tenuously at first in 1997. Like other exiled Tibetan religious groups, Shugden devotees had established religious centers throughout the world to attract new adherents, who often were also recruited for anti-Dalai Lama protests. The demonstrations became increasingly aggressive and vehement whenever His Holiness visited the West, reaching a point where the protesters began to attract the attention of the mass media. It is difficult to come across a neutral perspective on the Shugden controversy because most reports have been written by partisans in the schism. The nuances of the dispute are opaque to outsiders unless one is willing to delve into 400 years of Tibetan philosophy and history in order to begin to unravel contending theological aspects and the counterintuitive historical context. In this regard, this article only serves to scratch the surface of a complex problem. Moreover, there are varying shades of interpretation by the participants of the dispute. It is incorrect to suggest that the Shugden devotees are a monolith. That said, it requires less finesse to discern the geopolitical advantage for China in supporting the Shugden devotees. In a document titled “Some Opinions on Dealing Correctly with the Gyalchen Shugden Problem” dated February 20, 2015, the Tibet Autonomous Region Party Committee described the Shugden problem as “an important front in [the CPC’s] struggle with the Dalai clique,” a clear indication that the CPC sees Shugden devotees as allies in a struggle against His Holiness (provided, of course, that the devotees tow the party line in all matters). Certainly, journalists have suspected that the Chinese government finances overseas Shugden groups. Italian journalist Raimondo Bultrini investigated the possibility of funding coming from the United Front, an intelligence and propaganda arm of the CPC, starting in 1998. His book, The Dalai Lama and the King Demon, sets out his findings but its title also points to his own bias. In 2015, three prominent Reuters journalists published a report asserting broad Chinese support for the devotees but admitted that they had uncovered no direct evidence of financial support from China. Around the same time, a former Shugden devotee, Lama Tseta, held an interview with Voice of America where he claimed that he had witnessed financial support from Chinese officials to overseas Shugden groups in the effort to discredit His Holiness. However, no documentary proof was offered. While there is no hard evidence of financial collusion, it requires someone to be naïve in the ways of the espionage and psy-ops to believe that the CPC has played no role in the schism. While the direct evidence is not persuasive to prove funding from China, the circumstantial evidence is certainly not weak enough to conclude that there is no link. By supporting the Shugden devotees, the Chinese authorities may feel that they have found a cost-effective way to stick a finger in the eye of His Holiness’ prestige overseas, but the actual track record presents a less successful picture. Anti-Dalai Lama protests may make for gratifying visuals for the cadres in Beijing, but they are sparsely attended by a scattering of protesters whose awkwardly-phrased message — “False Dalai Lama: Stop Lying” — makes it easy to dismiss them as ciphers for Chinese propaganda. Surely, to refer to China as the “elder brother” of bordering states like Mongolia reinforces the impression of Chinese sycophancy among some Shugden groups. Similarly, the Shugden website might revel in the news that the government of Mongolia agreed not to permit another visit by His Holiness, but that promise is only as good as the lifespan of the current administration (which faces an election in 2020). Further, within three weeks of the ban by the Mongolian Foreign Ministry, His Holiness presided over the inauguration and consecration of the Mongolian Battsagaan Temple in Bodh Gaya, India in a ceremony that was attended by Khambo Lama Choi Gyatso, the Abbot of the Gandan Tegchenling Monastery in Ulaanbaatar and the head of Mongolian Buddhism. Clearly, His Holiness’ spiritual authority for Mongolian matters has not been hampered by Beijing’s protests or the declarations of appeasement by Mongolia’s Foreign Ministry. Even His Holiness’ trip to Arunuchal Pradesh reinforced the image of China’s ineffectiveness in diminishing his prestige, as witnessed by the 50,000 people who attended his gatherings. The trip underscored the prospect that the Tibetan clergy will be able to locate his successor without interference from Beijing. If one is keeping score, the cheerful aging monk from Dharamsala continues to hold his own very well against the Chinese behemoth. More importantly, an astute student of geopolitics would have to question the wisdom behind a hegemon advancing its own agenda by stirring up religious unrest. Such allies often have dramatically different agendas and cannot be predictably controlled, especially if their motivations are found in topics as nuanced and esoteric as Shugden propitiation. A Chinese official only need to consider the dramatic example of how U.S. support for the Afghan muhajideen precipitated the unexpected blow back of 9/11 decades later. Further, tacit support to Shugden propitiation in Tibet plants contentious seeds that will undermine China’s goal of pacifying and integrating Tibet. George Dreyfus, “The Shuk-den Affair: History and Nature of a Quarrel,” Journal of the International Association of Buddhist Studies, 21:2, 1998. Sam van Schaik, Tibet: A History, Yale University Press, 2013. Raimondo Bultrini, The Dalai Lama and the King Demon, Tibet House, 2012. M.A. Aldrich is a lawyer and author who has resided in East and Central Asia for nearly thirty years. His book Ulaanbaatar: Beyond Water and Grass is due to be published by Hong Kong University Press soon.